Iconic Northwest edible gifts: what’s on your list? Top ‘o my list? 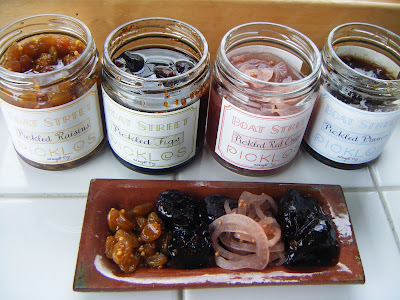 Pickled raisins — among other Boat Street treats. Ah, Jan! An interesting question, and a good one well worth throwing out to the Eatership. Whom, I’m betting, have great ideas of their own. Meanwhile, check out these edible gift ideas published last year in the Seattle Times. And speaking of traveling with edible giftage, do consider today’s front-page news, in which my colleague Carol Pucci offers the ins and outs of bringing foodstuffs onto airplanes. Then consider yourself armed with this knowledge, courtesy of Carol and the TSA: “If you can pour it, pump it, squeeze it, spread it, spray it or spill it” — pack it in your checked luggage, or ship it. P.S. The 3.4-ounce rule extends to carry-ons like Mama Lil’s pickled peppers, Tom Douglas’s “Rub With Love” marinades, Fran’s sinfully sweet sauces (presently sold out on the company Website, so try your local specialty market), Skillet Street Food’s bacon jam and my beloved Boat Street Cafe pickles. Now help Jan out here, folks. What “iconic” Northwest food-gifts top your list?